The first two legs of their California trip have not treated the Columbus Blue Jackets well. 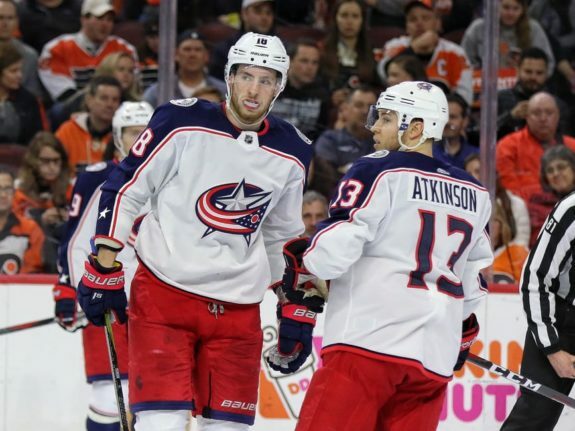 After a convincing 5-1 win against the Washington Capitals on Monday, the Blue Jackets hoped to carry that momentum into their annual trip to California. However the Kings and Ducks each had different ideas. The Kings scored five unanswered goals to defeat the Blue Jackets 5-2 on Thursday. Then on Friday, the Ducks used a shorthanded goal to help defeat Columbus 4-2. As a result of these two losses, the Carolina Hurricanes own the second wildcard in the East despite having the same point total. The Florida Panthers are right on their heels as well. Both games in California had similar feels to them. The Blue Jackets scored first in both games only to lose the lead when the opposition raised their games. Once Columbus fell behind, they couldn’t recover. Fear not, Blue Jackets’ fans. There is good news in all of this. The play of rookie Pierre-Luc Dubois deserves high praise. Ever since taking over the role of number-one center, he’s done nothing but impress no matter what the team throws at him. Although he hasn’t cracked the score sheet on this trip to California, he’s doing other things that are getting him noticed. His coach John Tortorella directly addressed this Friday night after the game in Anaheim. Dubois’ ascension through the Blue Jackets’ lineup is remarkable when you consider how the season started for him. He started on the wing playing around 10-12 minutes a night. Then he found himself getting limited minutes, including 4:17 on Oct 27 against the Winnipeg Jets. While all this was going on, the top line couldn’t find any chemistry. The Blue Jackets needed someone to click with Artemi Panarin. Enter 19-year old Dubois. He answered the call. Although the right-winger on that line has fluctuated at times with Josh Anderson or Cam Atkinson in that spot, Dubois has found a home. He’s demonstrating a chemistry with Panarin that no other player has been able to show. Dubois now has 14-17-31 for the season. This is impressive when you consider he started on the bottom-six and as a winger. He can score. He can play a physical game. He’s not afraid of the big moments. In terms of rookie ranks, Dubois’ 14 goals is ninth best in the league. He’s tied for eighth with four power-play goals and 11 power-play points. He’s also ninth in the league with 134 shots on goal. Dubois embraces the challenge. Tortorella referenced this when he said Dubois stood in against one of the best checking centers in the league in Ryan Kesler and didn’t back down. Just watching him, it just seems he is made for games like Anaheim, when the pressure is on and the stakes are higher. He fit right in and showed why he is an important part of the Blue Jackets’ future. Many look back at the 2016 draft when the Blue Jackets selected Dubois with the third overall pick and still wonder why they took him over Jesse Puljujarvi. We are seeing why now. Not sure I ever remember a team getting ridiculed more for taking the number-one ranked North American skater in the draft. That’s what Dubois was. The Blue Jackets were getting a really good player. After a slow start to the season in which he was getting adjusted to life in the NHL, Dubois has handled the role of number-one center with an eagerness to improve everyday. No matter what happens to the Blue Jackets the rest of this season, they may have answered an all-important question for future seasons. They might have their center of the future already here. If so, that’s wonderful news for the Blue Jackets’ organization. Centers are not easy to find. They may have one for the foreseeable future. All of a sudden, you have the components slowly falling into place in their pursuit of becoming a yearly contender. They have the goaltender in Sergei Bobrovsky. They have the young defense in Seth Jones and Zach Werenski. They have a game changer in Artemi Panarin. They now have a one-two punch of Dubois and Wennberg down the middle. Considering where this team was when John Davidson and Jarmo Kekalainen came on, the Columbus Blue Jackets have come a long way. There’s still work to do, but the framework is in place more so than I can ever remember in franchise history. Dubois’ star is shining brightly. It’s only going to shine brighter in future seasons.